A tsunami can appear in a number of ways. If the first part of a tsunami to reach the coast is a trough, rather than a wave crest, the water along the shoreline is dragged back dramatically, exposing parts of the shore that are normally underwater and stranding many marine creatures. Drawback can be a warning that a tsunami is approaching the shoreline but the problem is that the time between the sea water receding and the full tsunami moving in is usually only seconds or, at best, a few minutes. Because the drawback is the visible expression of half a cycle of the tsunami wave, it can last half of the wave's period (more than 10 minutes). 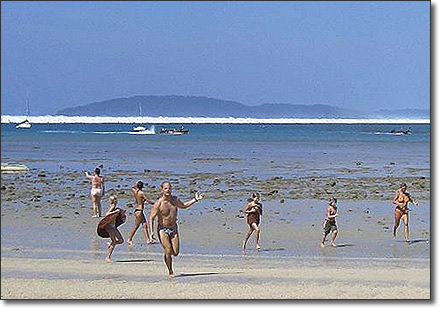 People unaware of the drawback danger, that can exceed hundreds of meters, often remain around the shoreline observing the exposed seabed and are obviously at great risk. 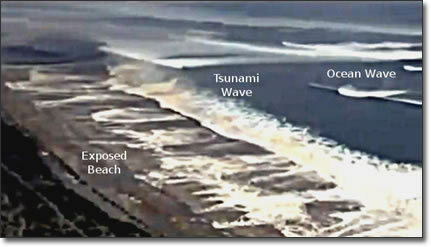 Whether inundation or drawback occur first is determined by how the tsunami is generated. Magnitude 8 earthquakes cause uplift of the sea floor and then subsidence (down) of the seafloor. Subsidence causes drawback and uplift will cause inundation.